Free Webinar: Verification, Validation, and Predictive Capability: What’s What? Registration is open for Inverse Problems Symposium 2015. For any interesting news or story, please send an email to info@inverseproblems.info. A chronological list of workshops and conferences can be found at events! New Positions are announced under Researchers and Groups. More news can be found in the news_2014_2 (April-June 2014) , news_2014_1 (Jan-Mar 2014) and the News Archive. This book provides a comprehensive introduction to the techniques, tools and methods for inverse problems and data assimilation, and is written at the interface between mathematics and applications for students, researchers and developers in mathematics, physics, engineering, acoustics, electromagnetics, meteorology, biology, environmental and other applied sciences. Basic analytic questions and tools are introduced, as well as a wide variety of concepts, methods and approaches to formulate and solve inverse problems. OCTAVE /MATLAB codes are included, which serve as a first step towards simulations and more sophisticated inversion or data assimilation algorithms. Further information about the Symposium and collocated events will be send out with the second announcement. Dear colleague. Please note the workshop on Stochastic Modelling in GFD, data assimilation, and non-equilibrium phenomena to take place 2-6 November 2015 at Imperial College London. All of the presentations that I have been sent should be available now on the workshop website: http://gmao.gsfc.nasa.gov/events/adjoint_workshop-10/presentations.html If I do not have a copy of your presentation, the link leads to an abstract instead. If there are any errors, or if you would like your presentation to be included, please contact Nikki. Aug 1, 2015. Dear Colleague. Please note the 5th Annual International Conference on Computatoinal Mathematics, Computational Geometry and Statistics ato be held at Singapore, 18-19 Jan 2016. The goal of the conference is to bring together active researchers from the various disciplines to showcase their state-of-the-art research results and hopefully to forge new cross-disciplinary interactions among the participants. The conference provides a unique opportunity for in-depth technical discussions and exchange of ideas in mathematical and computational sciences, as well as explores the potential of their applications in natural and social sciences, engineering and technology and industry and finance. "Non-negative Tensors: Applications and Algorithms"
The Conference Proceedings Print ISSN: 2251-1911, E-Periodical ISSN: 2251-192X will be indexed by Ulrichsweb, EBSCO, CrossRef, ProQuest, Zentralblatt MATH and will be submitted to Scopus, ScienceDirect and Cabell's Directories amongst others, where applicable. Journal: All authors who present their papers at the conference will be invited to submit an extended version of their research paper for the GSTF Journal of Mathematics, Statistics and Operations Research (JMSOR) (Print ISSN: 2251-3388, E-periodical: 2251-3396). All submitted papers will go through blind review process for acceptance. All accepted papers (after the review process) will be included in the JMSOR on a complimentary basis (free-of-charge). GSTF JMSOR is hosted and published on Springer’s Open Access publishing platform - Global Science Journals (GSJ). In addition, it will be indexed by EBSCO, CrossRef, ProQuest, Ulrichsweb, Cabell's Directories and will be submitted to Scopus, Google Scholar, IndexCopernicus, amongst others. Book: Selected authors will be invited to contribute book chapters in “Advances in Operational Research and Statistics” to be published by GSTF. CMCGS 2016 will also constitute a Special Panel Session. Panel Proposals are invited for submission. A minimum of three papers centering on a specific topic will be accepted for submission under Panel Category. to take place on July 18-22 at the University of Reading, United Kingdom, home to the Data Assimilation Research Centre. The ISDA 2016 continues a series of well received symposia: the German Symposium on Data Assimilation 2011, the ISDA 2012 at the Deutscher Wetterdienst (DWD) in Offenbach, Germany, the ISDA 2014 at the Ludwig-Maximilians-Universität (LMU) in Munich, German, and the ISDA 2015 at the RIKEN Advanced Institute for Computational Science (AICS), Kobe, Japan. The symposium will gather about 150 researchers and consist of invited talks from leading scientists spanning the field of data assimilation, extended poster sessions and short oral presentations with extended discussion. 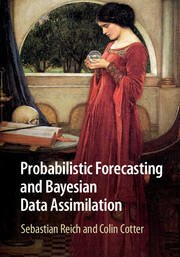 In this book the authors describe the principles and methods behind probabilistic forecasting and Bayesian data assimilation. Instead of focusing on particular application areas, the authors adopt a general dynamical systems approach, with a profusion of low-dimensional, discrete-time numerical examples designed to build intuition about the subject. Part I explains the mathematical framework of ensemble-based probabilistic forecasting and uncertainty quantification. Part II is devoted to Bayesian filtering algorithms, from classical data assimilation algorithms such as the Kalman filter, variational techniques, and sequential Monte Carlo methods, through to more recent developments such as the ensemble Kalman filter and ensemble transform filters. The McKean approach to sequential filtering in combination with coupling of measures serves as a unifying mathematical framework throughout Part II. Assuming only some basic familiarity with probability, this book is an ideal introduction for graduate students in applied mathematics, computer science, engineering, geoscience and other emerging application areas. June 10, 2015. There will be several lectures on Data Assimilation and Inverse Problems at the University of Crete. This is in the framework of the “Pichorides Award” (http://www.ite.gr/index_main.php?l=e&c=54&i=4, see also http://fourier.math.uoc.gr/tmem/pichorides-lectureship.html), awarded to Roland Potthast for 2015. May 15, 2015. Dear Colleague, please have a look at the following seminar. Engineering organizations must increasingly rely on computational simulation for design and predicted performance, reliability, and safety of systems. Computational analysts, designers, decision makers, and project managers who rely on simulation should ensure that practical techniques and methods are in-place for assessing simulation credibility. This webinar presents an introduction to the topics of verification, validation, and predictive capability. These topics are applicable to essentially all engineering and science applications, including fluid dynamics, heat transfer, solid mechanics, and structural dynamics. The mathematical models for the systems of interest are typically given by partial differential or integral equations representing initial value and boundary value problems. The computer codes that implement the mathematical models can be developed by commercial, corporate, government, or research organizations; but they should all be subjected to rigorous testing by way of verification procedures. The accuracy of the mathematical models coded into software are assessed by way of comparisons of results with experimental measurements; referred to as validation activities. This webinar will sketch a framework for incorporating a wide range of error and uncertainty sources identified during the mathematical modeling, verification, and validation processes, with the goal of estimating the total predictive uncertainty of the simulation. This is referred to as predictive capability because typically no experimental measurements are available for the systems or subsystems at the application conditions of interest. May 14, 2014. The next LMS inverse day will be at the University of Cardiff on 12 June 2015, see: http://www.damtp.cam.ac.uk/user/cbs31/LMS_Inverse_Day_Cardiff_June_2015/Home.html where information on how to register (free of charge) is also posted. Also, it would be great if you could advertise this meeting among your colleagues interested in inverse problems. Please especially encourage early career researchers such as PostDocs and PhD students to participate and present a poster at the meeting. It is a great place for them to network and publicise their work in the community. Also, we will award a poster prize of 100 pounds to the best student poster. April 2, 2015. The European Space Agency is organizing, in the context of the Scientific Exploitation of Operational Missions (SEOM) element, a conference on the topical theme atmosphere. The purpose of this conference is to provide a forum for scientists to present results from their ongoing research using data from past and current atmospheric instruments like ERS-2, Envisat, Metop and ESA Third Party Missions. Furthermore this conference is dedicated to prepare for the scientific exploitation of the Sentinel-5 Precursor mission. The Conference will be held at the University of Crete (Greece - Heraklion) from 08-12 June 2015. The workshop is open to ESA Principal Investigators, co-investigators, Sentinel-5 Precursor users, scientists, students, representatives from national, European and international space agencies and value adding industries. The European Space Agency, in the context of the Scientific Exploitation of Operational Missions (SEOM) element, is organising an event dedicated to prepare for scientific exploitation of the Sentinel-3 mission, entitled “Sentinel-3 for Science Workshop”, which will be hosted in Venice -Lido Palazzo del Casinò, Italy, from 02 – 05 June 2015. The workshop is open to ESA Principal Investigators, co-investigators, Sentinel-3 users, scientists, students, representatives from national, European and international agencies and value adding industries. The outcome of this workshop will help to further shape the next generation of R&D activities in the frame of ESA Earth Observation Programme. For more information see http://seom.esa.int/S3forScience2015/. We are proud to present the program for this years EnKF ws, please visit our website: http://enkf.iris.no/ Please also note that registration is open and that the registration deadline is April 27th. Conference will be held May 31-June 2, 2015, Michigan State University, East Lansing, MI. We look forward to seeing you in East Lansing. March 3, 2015. Dear Colleagues, the Franco-German Summer School on Inverse Problems for Waves takes place from August 24-28 at Ecole Polytechnique, Palaiseau, France. This event is generously supported by the Franco-German University, the University of Bremen, Ecole Polytechnique and INRIA Saclay Ile de France. The summer school considers recent advances in analytical and numerical treatments of inverse problems related to waves. The courses are designed for advanced Master students, PhD students and PostDocs in mathematics. A limited number of participants will also have the opportunity to present their research in dedicated sessions. Feb 27, 2015. Developments in numerical methods underpin simulations in many ways, for example in any area where high dimensional problems are governed by differential equations. Computational fluid dynamics has driven many developments in this area; however there is a wide range of application areas where the problems, and indeed solution techniques may be similar. Numerical methods are important in diverse areas such as geophysical modelling, fluid-structure interaction, high-dimensional dynamical systems, weather prediction, climate modelling, oil reservoir simulation, and so on. The conference will bring together application specialists, applied mathematicians, numerical analysts and computational scientists who develop and use numerical simulations. Applications which focus on data assimilation, inverse problems, uncertainties or control, which contain as a major component a high-dimensional forward model, will also be represented. Abstracts are requested for contributed talks in any area consistent with the conference themes. Talks will be accepted for either oral or poster presentation on the basis of a one- page extended abstract in PDF format, which should be sent via email to conferences@ima.org.uk by Friday 27 March 2015. Feb 26, 2015. Dear friends and colleagues, We encourage you to send abstracts in both new developments and realistic applications of the EnKF and related data assimilation methods. Please notice that the abstract deadline is March 2, and that no full paper is requested at this workshop. For more details, please view our web page: http://enkf.iris.no/ . The web page is constantly being updated, please notice the title of the invited talks and also notice that the round trip is included in the registration fee. Feb 9, 2015. Dear colleagues, The “8th International Workshop on the Analysis of Multitemporal Remote Sensing Images” is organised on 22-24 July in Annecy (France) this year. A special session on “Inverse problem and data assimilation” is scheduled in order to provide a forum for presentations and discussions of the latest research in inverse problem and data assimilation across the elements of the Earth system (atmosphere, ocean, vegetation, geomagnetism, tectonics, …). The keynote spreaker for this special session will be Olivier Talagrand. If you are interested in presenting your work and sharing with other colleagues, note that the abstract submission deadline is the *27th February 2015*. All accepted papers will be included in the conference proceedings indexed by IEEE-Xplore. Moreover, all authors are invited to submit their work to a special edition to be published in J-STARS (Journal of Selected Topics in Applied Earth Observations and Remote Sensing) (deadline: September 30, 2015). We are looking forward to seeing you in Annecy. 5.2.2015. Abstracts are due tomorrow. Please follow the instructions in the 3rd announcement, a copy of which is appended to this e-mail. We realize that some may be late, but please get them to us ASAP so that we can begin to plan the program. A list of all received abstracts will be broadcast to everyone on our mailing list of interested persons next week. Later we will send instructions for registering at the hotel. Some people have questions regarding the conference cost and limits on costs for lodging and meals imposed by their funding agencies. The U.S. Government, for example, considers rural West Virginia as an inexpensive location, but its limits will only get you a tent to sleep in and a Mac Donald's to eat in (which are only slight exaggerations). Both our room and meal costs exceed those limits, although the way the conference is priced, I do not know what those amounts actually are: we are getting a “conference rate” that includes the costs of conference room and audio-visual rentals, coffee breaks, various hotel fees, besides individual room and meals. This is necessary because we have no way to collect large conference registration fees from everyone that would otherwise pay for these necessary things. The hotel is therefore collecting these by rolling them into individual's costs. I have discussed this problem at length with the hotel, who of course have their own accounting rules to follow. Nonetheless, they have been accommodating. So what may help some of you is that, upon paying your hotel bill, you will receive 2 papers. One will be be a copy of the “handbill.pdf” breaking down the conference rate into 3 components. The rate for “students” is actually the rate for anyone sharing a room. The 2nd page of the “hotelfolio.pdf” is essentially the normal bill, except yours will have the “Resort fee” rolled into your “conference package.” Note that this fee contains, among other things, your daily entrance fee to the State Park in which the hotel is located. Also note that travel managers who want to make your attendance difficult may thereby get confused by the applied government taxes, but this is the best we can do. So, if you expect a problem, get it cleared before you register. Some managers, however, are more lenient about regulations for costs that otherwise appear reasonable. For postdocs and students who have requested funds but who have not yet received a definitive commitment from us, we are still working on obtaining additional funds. We hope to know more by early March. This announcement is being sent to the 90+ researchers who have expressed an interest in attending the workshop. We are requesting titles and short (<300 word) abstracts of what you would like to present at the workshop. These should be provided to us by 6 Feb. 2015 in the format described below. Presenters will be allowed to reasonably modify their abstract prior to our publishing the final program and list of abstracts on our website before the workshop's start. Please follow the guidelines below. 1. Submit only one abstract. Your name may be included on other abstracts only if your coauthors truly intend to present those others themselves. 2. An abstract should be sufficient for the committee to confirm its relevance to the workshop and to assign its most appropriate place in the program. Use the format described at the end of this mailing. 3. Do not attempt to simply describe all the wonderful work you have performed during the past few years, but instead focus on just a few things that you have learned that may be of interest to most of us. Since the audience will want to evaluate your contribution rather than just see or hear it, better is to be thorough and specific rather than vague and general. 4. Indicate whether you prefer an oral or poster presentation or either. Note that the program will allow ample dedicated time for posters but that there may not be time for all who request an oral time slot. The latter will be approximately 20 minutes each, plus additional time for questions/discussion. You should not need to include descriptions of general fundamentals since these should be described in the pre-workshop tutorials or in the more detailed presentations of issues in earlier invited, review-like talks. 5. Hotel reservations will be required by sometime in April, so you will be notified of acceptance of your abstract before 6 March, at which time we also hope to provide a rough program draft. 6. The cost for 5 days/nights room, meals, registration, taxes (combined expenses payable to the hotel) will be approximately $1300 (single occupancy) or $885 (double occupancy). Information about transport options between the hotel and Pittsburgh International Airport (PIT) will be forthcoming. 7. Students and postdocs who have requested partial support from workshop funds will receive further instructions within the next few days. Feb 5, 2015. Dear All, Cambridge will be hosting the 2015 combined British Mathematical Colloquium (BMC) and British Applied Mathematics Colloquium (BAMC). Joint BMC/BAMC meetings only take place every five years, and this meeting will also include a special set of sessions and plenaries in honour of the 150th anniversary of the London Mathematical Society. Keynote speakers at the meeting will include Robert Calderbank, Ingrid Daubechies, Jacques Dumais, Phil Hall, Peter Kronheimer, Sylvia Serfaty, Wendelin Werner and Andrew Wiles, and a public lecture is scheduled to be given jointly by Stephen Hawking and Michael Green. The joint BMC/BAMC meeting will run from 11:00 on Monday 30th March 2015 to 13:00 on Thursday 2nd April 2015, with the celebration of the 150th anniversary of the LMS taking place during Wednesday 1st April 2015 followed by the conference dinner that evening. For further details, please visit www.bmc-bamc.org.uk. plus several contributed talks and posters. We think this will be a very interesting meeting and we hope that you can participate and can motivate some of your students and PostDocs to present a poster there! The deadline for early bird registration as well as for submission of abstracts for posters or contributed talks is this Saturday, the 7th of February! Feb 5, 2015. We encourage you to send abstracts in both new developments and realistic applications of the EnKF and related data assimilation methods. Please notice that the abstract deadline is March 2, and that no full paper is requested at this workshop. Please view our web page: http://enkf.iris.no/ for more details. There is the opportunity for companies to sponsor certain events at the workshop, such as lunch, dinner, coffee break, etc. Please contact Mette Stokseth Myhre or me if you should be interested in this. 22.1.2015. Data assimilation has become an important component of modelling for a growing number of applications in the geosciences and in engineering. This training course will provide an overview of the theory and practical methods of data assimilation. First the basic concepts from statistical estimation theory and nonlinear optimization will be given. The classical variational and Kalman filtering approaches to data assimilation will then be described. The lectures will also cover more specialized topics including covariance modelling and estimation, advanced minimization algorithms, preconditioning, and hybrid ensemble-variational methods. The lectures on the theory will be complemented by both practical exercises and presentations on specific applications at CERFACS in the geosciences (oceanography, atmospheric chemistry and hydrology/hydraulics). Target participants: This training session is for engineers, physicists, computer scientists and numerical analysts wishing to learn the fundamentals of data assimilation and the numerical methods to develop data assimilation applications. Prerequisites: Good knowledge of linear algebra and numerical analysis.